When an impactor arrives with a lot more energy — being larger or moving faster, or both — it blasts a bigger hole, making what scientists call a complex crater. The transition from simple craters to complex ones starts at 5 to 8 kilometers (3 to 5 miles) in most parts of Mars, but in some it occurs at 9 to 12 km (5.5 to 7.5 mi). As the name suggests, besides being larger, complex craters show more features than do simple craters. The more energy the impact delivers, the bigger the cavity in the ground. But immediately following the blast, the center of the cavity begins to rise as rocks under the impact site rebound from the shock. The result of this uplift is a central peak or cluster of peaks. Compared to simple craters, complex craters also generate a lot more impact-melted rock. This typically flows and pools like lava to form a sheet that covers the shattered rock (breccia) on the crater's floor. The crater's inner walls may slump downward, rotating backward in blocks. This can widen the crater's rim, and line the inner walls with terraces. The blanket of ejected debris, called ejecta, outside the rim looks rumpled, bumpy, and hilly; scientists call it a "hummocky" appearance. It often shows radial lines, evidence of violent outward flow at ground level. In addition, chains of small craters may line up and extend out from the crater. Scientists call these radial impacts secondary craters because they formed by the impact of debris blocks thrown out in the main (primary) crater impact. Secondary craters also tend to gather in clumps and clusters. Secondary craters are important to be aware of because many can be confused with small primary craters. 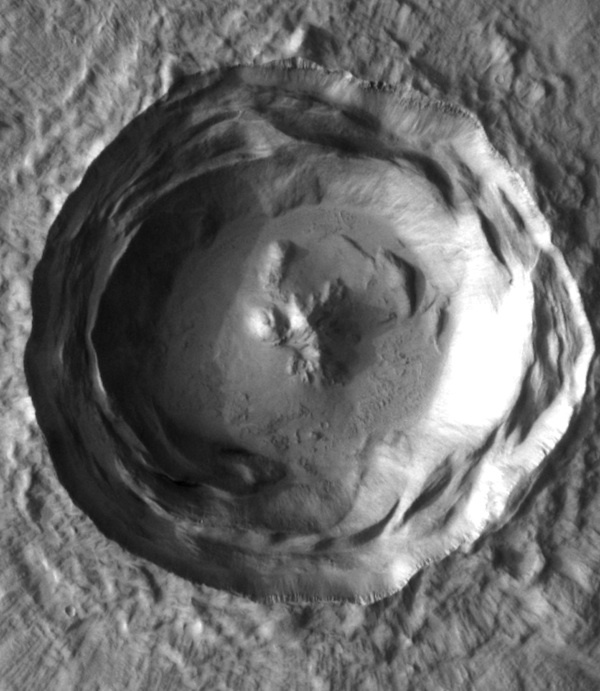 A small crater with a rim that's noticeably higher on one side is likely a secondary, especially if several in the area show rims elevated in the same lopsided way. 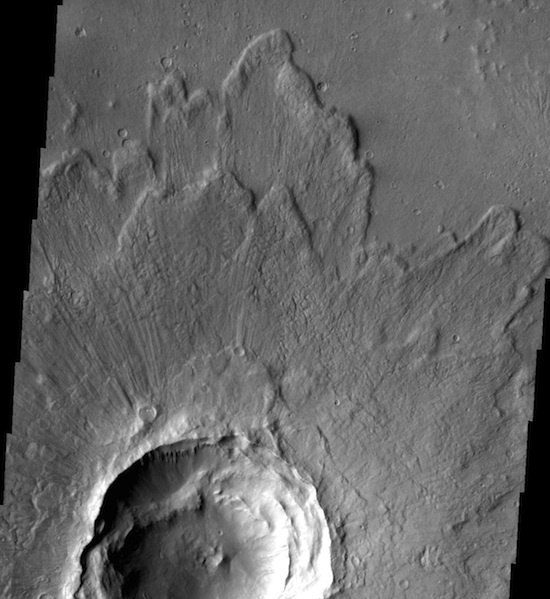 They probably formed by low-angle impacts of ejecta thrown from a primary crater. Mars has lots of secondaries. For example, scientists have estimated that flying debris from one fresh 10-km crater named Zunil created roughly 10 million secondaries. These range from 10 to 200 meters in size and lie as far as 1,600 km (1,000 mi) away from Zunil. That is about the distance from New York City, NY to Jacksonville, Florida.